In youth group we just finished studying Acts 13 this week. So, I want to backtrack just a little and talk about something we looked at a few weeks ago. It happened in Acts 9. Before Pentecost (Event in which disciples were given Holy Spirit. See Acts 2 for the whole story), Peter couldn’t have done something like this. But, after the outpouring of the third Person of the Trinity (Holy Spirit), Peter’s life was changed. He had received the same Spirit flowing eternally back and forth between the first Person of the Trinity (The Father) and second Person (Jesus). The Spirit is life because the Spirit is God. Three distinct Persons (Father, Son, and Spirit) who make up our One great God (think too hard about it and it hurts, at least for me). And Peter, by faith in Jesus Christ was welcomed into the Trinity, not to be made or turned into a god, but to become like God. I read this short story in Acts 9:36-43 and my curiosity is peaked. To think of Peter bringing someone back from the dead seems absurd! Healing a cripple is plausible, but bringing a dead person back to life? But, why should it surprise me? Those of us who have confessed Jesus Christ as Lord and believe in our hearts that God raised Him from the dead are given a deposit. Ephesians 1:13 reminds us of what that deposit is: The Holy Spirit. So, I shouldn’t be surprised at God’s ability to work through Peter in the Person of the Holy Spirit to raise the dead. This wasn’t the first time God raised someone from the dead. - What do you think of this story? - Do you find it hard to believe? Peter bringing someone back to life? - Have you ever heard of this happening today? Tim that is an amazing story. To think that Peter could bring someone back to life is almost more that I can grasp. He was just an ordinary man, with many problems. He is a great example of God not calling the qualified, but qualifying the called. That is so true! It's amazing what God can do when we allow Him to do it! I believe God still works like this today, using miracles to heal others. We just need eyes to see it. Hi Tim, my beliefs are different to yours and I was a bit nervous about writing in your blog but I thought you may want to know about this story that reportedly happened to me. My mum is a strong Catholic - more modern than devout in the traditional sense, but a wonderful, Christian woman. When I was a baby we lived in Africa and had a pool in the garden. One day I 'drowned' in it. My dad is a doctor (and agnostic/athiest) and pulled me out and tried mouth to mouth. The story as I was told it (and obviously I can't remember it) was that I did not 'wake up' until mum had taken me to the church and had been distraught for some time within the church. Apparently it was only once she had calmed down and was sat at the priest's table with a cup of tea that I woke up and asked for a chocolate biscuit. The thing is I've seen photos of our house in Africa (taken from dad's plane) and it is surrounded by miles and miles of nothing - we're not talking popping 5 mins down the road to the church. The fastest way dad could have got there was by plane, but even then we must be talking at least half an hour. So for that long I was in a state that a doctor thought was not breathing.... makes you think huh? I swear it is the truth as I was told when I was a child. There are many stories about young children surving what seemed like death by drowning but these are usually put down to the water being very cold and therefore the body going into a cold induced coma where the heart slows right down but doesn't stop - obviously this theory doesn't hold up in Africa. Up until about 19 yrs old had a strong faith and believed that this was a true miracle. I find faith a difficult thing now. My mum always said that faith was a gift from god and god hadn't given that gift to my father and that's why he didn't come to church with us each week. He has always supported her, never once undermined her bringing us up as Catholics and when they travel (which they do a lot, especially now we've all grown up) they both always find a church, whichever country they are in and both go. He is a good and honest man, a doctor who spent much of his life working in the third world for not much money. I think he was put off religion by his father who was a Scottish clergyman, very into fire and brimstone (one of his favourite sayings which has stayed with me and become a mantra is 'tell the truth and shame the devil'). Do you think that his and my reaching toward god, even if we find it really hard to truly believe - is enough? Is faith really a gift from god or is it something in our control? I've lost my faith and although I truly want a connection with god (and there is definitely a god) I'm just not sure why Christians are any more right than any other world religion. I think that man instictively needs to know god and reaches toward god and that each religion is man's way of trying to reach god and explain god. They are all different because the cultures that they grew in were all different. I hope this isn't offensive to you (I totally respect and am quite envious of your faith in something more solid) - What do you think? What advice would you give me? I happen to believe that faith is a gift of God, but it is for everyone. Not a select few. It is our choice to receive it. Jesus seems to be the one religious figure who meets us where we are at. If a miracle like this occurs, to me it means that God needed someone here for a little bit longer to serve another certain purpose. Everyone who is alive is in some way proving God to be true. A standard of right and wrong (conscience), pleasure sought from serving others, the act of being born, maturing, and eventually dying all point to the existance of God. And we have that choice, a true genuine choice, to put our faith in Him. If we couldn't choose not to, it wouldn't be our choice. Now I have never seen a person raised from the dead. However, I have seen things that happen which are truly unexpected and completely our of the realm of understanding except that God did it. Hey, thanks for all the discussion. Jk I’m amazed and honored you stopped to read a blog who you have no idea who the writer is. Thanks! Don’t feel troubled about disagreeing w/ me. Now if you mean reaching towards God by accepting Jesus Christ as your savior and striving to nourish a relationship with Him, then you have what Christianity offers to the world…a personal relationship with God. And yes, I see our faith in Him as a gift from God (See the book of Romans). I don’t really know what type of advice to give (don’t give advice very often). I guess I would advise you to put yourself in God’s grace. By all means go to church, pray, and read the Holy Scriptures. By doing so, you might discover exactly what it is you desire. And you might discover how close God really is or maybe, it gets better, that He has been pursuing you! Well, don’t know if that helped at all or if I answered your questions. But again, thanks for your honesty and commenting! To Tim: Hey babe, nice job again. I really see the Lord using you in your writing. Sometimes it amazes me the way you can write! To JK: Hi Jenny (I read your comments on my friend Jenny's blog too!). I'm Tim's wife, Trina-- just wanted to say that I think your story is definitely a miracle. A very cool one! I agree that God saved you from death because he has a purpose for your life that no one else can fill. I like you! I think your comments are very interesting and I agree with norwelltennis that faith is a gift from God to anyone who wants it--it's just a matter of who chooses to accept it. God says in his word that those who seek will find. And I believe you will!! As for why Christianity over other religions...first of all, your observation about man instinctively reaching for God is a good one because that's how he planned things. Paul basicly says that same thing in the Bible(Romans 1:19-20 "since what may be known about God is plain to them, because God has made it plain to them. For since the creation of the world God's invisible qualities--his eternal power and divine nature--have been clearly seen, being understood from what has been made, so that men are without excuse.") God has revealed himself through his creation so that we would know who was and is and will always be God. But back to why Christianity--Is there any other religion or god that tries so hard to get you to love him? I love my husband but he doesn't even come close to romancing me the way God does. Love letters (the Bible), he doesn't just bring me roses from Wal-Mart--He created the roses that come from Wal-Mart! 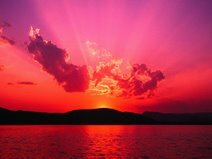 The hot pink, purple, and blazing red sunset?? His very life on a cross?? Wow. Heaven. An even bigger wow. But even more than a promise for a future in eternity is the peace he gives right now. The other day Tim and I were scrounging up change to go buy a loaf of bread and I was a little discouraged about the whole situation but I knew God would supply what we needed and the next day I was buying a cart full of groceries. THAT is why Christianity over other religions. Who else offers a God like that? If he loves me that much and more and he says that the only way to the Father is through the Son then I have to choose to believe that. I'm convinced. And don't get me wrong--just because God is a romancer doesn't mean he's a weak little guy either. My God has fire in his eyes when he is filled with righteious anger. When the devil tries to steal, kill, and destroy his children it makes him angry. I love that about him too. Actually, that still falls under romantic--like when your husband is jealous--God is jealous. I'm just in love with God and I don't tell enough people that. Sorry about all the jabbering. Once I get going it's hard to stop! Well I hope that maybe started to answer your question even just a tiny little bit?? I should get home, it's 11:00 at night and I'm still at the church. Hope to hear from you again.